Many common enquiries we receive can be answered by reviewing our list of “Answers” to the “Frequently Asked Questions” located immediately below, please have a browse as this may save you some time. Q. Do I need a PayPal account to check out with PayPal? A. No, you do not need a PayPal account to use the PayPal Checkout option. You will be redirected to PayPal’s secure payment gateway where you can choose the PayPal Guest Checkout which accepts credit cards for payment. Q. Ordering Information – How to Order? EFT Direct Deposit via online banking, Fill in your Details on the “Check out Page”, tick the “Terms and Conditions” box, then click “Place Order” Button. An order confirmation will be emailed to you with Puzzle Palace Australia’s Bank Details. Use the Order ID from your Order Confirmation as the payment reference when making your payment via online banking. * Your Order will be dispatched once your funds have been confirmed as received in our Bank Account. Cheque/Money Order Fill in your details on the “Checkout Page”, tick the “Terms and Conditions” box, then click the “Place Order” button. An order confirmation will be emailed to you. Make the Money Order or Cheque payable to PUZZLE PALACE AUSTRALIA. Write your “Order ID” on the back of the Money Order or Cheque and send to Puzzle Palace Australia, PO Box 5033, Old Toongabbie NSW 2146. Your Order will be dispatched once your funds have cleared. Q. Can I Order by Phone / Post ? A. No, we are an online Store only. If you have any difficulties with our website, please use the Contact Us page and we will work to amend the problem as soon as possible. A. No, we do not accept Backorders. If the product is ‘Out of Stock’, you will not be able to order the product on our website until it is back in stock again. The Puzzle Palace Australia website is designed NOT to accept Orders for ‘OUT OF STOCK’ products. There will be no ‘ADD TO CART’ button available on the product page, and ‘OUT OF STOCK’ will also be displayed. You can Join our Waitlist. You will receive an email alert when the product is Back in stock. A. We accept payment securely by PayPal Account or Credit Card without exposing your details. When paying online, your details are protected by PayPal SSL encryption. No Credit Card information is provided to Puzzle Palace Australia. We also accept Cheque, Money Order or Direct Deposit. Goods will be shipped once your personal cheque has cleared or your Direct Deposit Payment has been received into Puzzle Palace Australia’s Bank Account. Please allow 4 working days clearing for personal cheques. Also see “How to Pay” located at the bottom of the Home Page. Q. How do you Ship and Deliver? A. Orders are sent using Australia Post and Australia Post eParcel. Orders dispatched by Australia Post EParcel will require a signature on delivery. If the driver is unable to obtain a signature from someone, a card will be left and the order will be taken to the nearest post office where it can be collected. It is not possible for a parcel to be left without a signature for eParcel UNLESS you choose to allow Australia Post to leave the consignment at your premises should no one be available to sign for the parcel. This is called Authority to Leave. If you are happy for your items to be left in a safe spot you can request this by placing a comment in the box at checkout, such as ‘leave parcel at front door if not at home’. In doing so, you assume all responsibility for the delivery of the parcel. By placing an order on this website Puzzle Palace Australia you authorise the passing of your email address and mobile phone number details to Australia Post for the purpose of providing tracking notifications where applicable. Once your order has been dispatched, you will receive tracking email notifications directly from Australia Post TRACK MY ORDER ONLINE HERE. If you appear not to be receiving your Australia Post tracking emails, please check your junk/spam mail box before contacting us. You need to allow 3 to 10 working days (Western Australia 3 to 15 working days) for delivery of your order depending on your location, before contacting us to trace your order. During the Holiday Season, orders can take longer to be dispatched and delivered. If you need an item urgently, please Contact Us to ensure it will reach you in time. Shipping costs are a Flat Rate of $9.90 per order for standard delivery. Free Standard Delivery is offered on all orders over $150.00 and is automatically applied at checkout. Please ensure that your delivery address is complete and correct. In the event that a parcel is returned to us due to an incorrect or incomplete delivery address being provided, there is an Australia Post return fee of $10.00 charged. Your order will be cancelled and a refund issued for the Purchase Price less the Australia Post $10.00 return fee. If you still require your purchase, you will need to re-order on our website as we do not resend orders that have been returned to us due to an error you have made in the shipping address. In the event that you are left a card by Australia Post for collection, please be prompt in collecting your parcel from the Post Office as Australia Post will only hold your order for 10 Business Days. If it is not collected within the 10 Business Days it will result in it being returned back to Puzzle Palace Australia and a $10 return fee is charged by Australia Post when this happens. Once your order is returned to Puzzle Palace Australia by Australia Post, your Order will be cancelled and a refund will be issued for the Purchase Price of the goods less the $10 Australia Post return fee. If you would still like your purchase, you will need to re-order on our website as we do not resend orders that have been returned to us due to non collection of parcels. A. We offer a gift wrapping service with a choice of options. You have the option of making use of this extra service by clicking on the link Gift Wrapping when you are ordering your Jigsaw Puzzle. We do NOT offer gift wrapping services for the following products, Porta Puzzle Board, Porta Puzzle Deluxe, Porta Puzzle 1500 Piece, Porta Puzzle 1000 Piece. A. After we ship your order, you will automatically receive tracking notifications from Australia Post which will contain a link to the Australia Post “Track my Order site“. Please check your junk mail/spam if you are not receiving the notifications. You can also track your order using our Track my Order tool . This will take you to the Australia Post website where you can enter your tracking number. A. We are a 100% Australian owned and operated business and we are located in Sydney, Australia. All of our items are held locally & are shipped from our warehouse in Sydney. We ship by Australia Post E-Parcel. We suggest you wait 3 to 10 working days (Western Australia 3 to 15 working days) for delivery depending on your location before contacting us. During the Holiday Season, Orders can take longer to be dispatched and delivered, so please keep this in mind when placing your order online. Q. Can I Pick my Order Up? A. We focus on being efficient with fulfilling our online orders – Unfortunately, this means, we do not operate a shopfront or allow public access to our warehouse to pick orders up. Australia Post Delivery services are available. A. We do not ship internationally at this time. Q. I need my order as soon as possible? A. For fast delivery, orders can be shipped by Express Post using Australia Post Guaranteed next day Delivery but only in Australia Post next day guaranteed delivery Areas applicable to Australia Post Terms & Conditions. There may be an extra Charge for this Service. Please Contact Us if this is a requirement. A. Jigsaw Puzzles today are made with highly automated equipment and machinery, so it is very rare to have a missing piece in the sealed box, although on the rare occasion unfortunately this can happen. If the Product you purchased from Puzzle Palace Australia has a piece missing due to the piece being lost or misplaced after opening, this is not a defective product and we are unable to assist with replacing individual pieces, we cannot be of assistance to you. 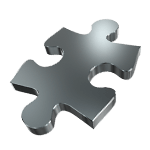 You could contact the manufacturer of the jigsaw puzzle as some offer a replacement puzzle piece service. Recipients can choose from our wide selection of jigsaw puzzles and accessories. It is the perfect Gift for friends, family or co-workers. You choose the Gift Voucher amount in $ dollars that you would like to gift to someone special. Q. Need to ask something else? Our Office and Warehouse Hours are 9.00 am to 5.00 pm, Monday to Friday to attend to all email enquiries, Excludes Public Holidays.